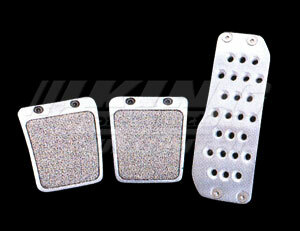 Mugen Sports Pedal Kit - MT 46545-XG5-K2S0 - King Motorsports Unlimited, Inc.
For sports driving nimble footwork is needed. With the Mugen SportsPedal Kit the accelerator is made to allow some grip give, while theclutch and brake pedals are made with a nickel-chrome blown metal non-slip surface. This allows a sure grip on the brake while performing heal/toe footwork.All the pedals have a cast aluminum base.